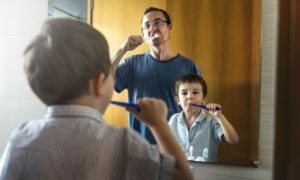 According to the American Dental Association, the best way to manage oral care at home is to brush at least twice a day for two minutes at a time. You should always make sure to use fluoridated toothpaste as fluoride is the essential mineral that prevents tooth decay and remineralizes existing enamel. Most people brush in the morning and at night as part of their routine, but any time of day is fine, especially after meals. Furthermore, you’ll want to make sure that your toothbrush uses soft bristles. Using a hard-bristled brush can easily cause you to accidentally wear down tooth enamel, permanently damaging your smile. Use gentle, back-and-forth strokes, especially once you start brushing along the gum line. After you finish brushing, brush your tongue as well. Bacteria loves to cling to this warm area of the mouth and cause bad breath. Brush from the back of the tongue towards the front. Did you know that brushing only works to remove about 60 percent of plaque from your mouth? That means the remaining 40 percent is leftover on all the edges of your teeth where only floss can reach. Flossing is ideal for removing food debris, but it’s essential to removing plaque that builds up in areas where toothbrushes are ineffective. To start, pull out 18 to 24 inches of floss at a time. Wrap the floss around each of your index or middle fingers and gently thread it in between each tooth. Move back and forth, making sure to reach all the surfaces of your tooth. If your floss gets caught easily, switch to a thinner, monofilament variety. If you struggle to use traditional floss, purchase a floss holder or floss picks to make it easier. Finally, you should always ask the hygienist at the end of your appointment if you can schedule your next biannual cleaning. Dentists recommend that you schedule cleanings once every six months in order to protect your oral health and catch early signs of systemic disease before they can develop. By visiting regularly and committing to at-home oral care, you prevent bleeding gums and toothaches from happening in the first place. Celebrate dental hygiene this month by scheduling your next appointment today! Dr. Lyle I. Bonny earned his DDS degree from the University of Washington Dental School. He’s always working hard to continue his education, help patients improve their at-home oral care, and provide a very high standard of care to the community. To learn more about his preventive treatments, practice or meet his team, you can contact him through his website.